Last edited by Munaf ikka; 11-11-2012 at 11:42 AM. Last edited by breakingviews; 11-02-2011 at 12:37 AM. Buzz is that the third Khan sibling might join Salman and Arbaaz Khan in Dabangg sequel. While Salman Khan and Arbaaz Khan were seen together in Dabangg , chances are that the third Khan sibling might make his presence felt in the Dabangg sequel. While Arbaaz Khan, who produced Dabangg has already taken charge of the sequel as a director, there is buzz that the youngest Khan sibling has expressed his desire to be a part of the sequel as well. 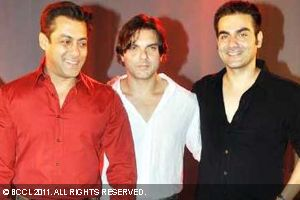 It is a known fact that Salman Khan has been a big support to the career of both his brothers – Arbaaz and Sohail Khan. Sohail has often tagged along big brother Salman Khan in films like Veer, Heroes, Main Aurr Mrs Khanna, God Tussi Great Ho and Maine Pyaar Kyun Kiya . Arbaaz had done that earlier in Garv and now with Dabangg . This time seems like it will be a complete family reunion if the trio come together in Dabangg 2 . And knowing how the success of Dabangg helped Arbaaz Khan resurrect his career, Dabangg 2 might additionally help Sohail Khan as well. While Sohail Khan had directed Salman and Arbaaz in films like Pyaar Kiya Toh Darna Kya and Hello Brother early in his career, if all goes well, Arbaaz will direct Salman and Sohail (along with himself, of course) in Dabangg 2 . However before that Salman has to work on Sohail Khan’s Sher Khan . Nevertheless, what the purported remake of Amar Akbar Anthony (that never took off) could not do, perhaps the sequel of Dabangg 2 would do. Salman and Aamir have set an example and industry is now waiting with bated breath to see if Ajay Devgn and Hrithik Roshan follow the same route as well. Since Salman and Aamir have juggled release plans of four of their films, bigwigs in the industry feel that Ajay and Hrithik too should sit across the table and finalise on plans for Tezz and Agneepath once for and all. However, as of now Karan Johar as well as Priyadarshan are not budging from their stand and continue to stick to their 26th January plans. Since both films are multi-crore affairs and high stakes are involved, none of the two parties are willing to blink first. Hope the actors are listening and Salman-Aamir turn out to be role models here. As the latest addition to its already overflowing cap, music emperor of Bollywood, T-series post the sensational music release of Shahrukh Khan starrer RA.ONE, has now acquired the audio rights of Salman Khan starrer Arbaaz Khan’s DABANGG 2 (sequel to 2010’s blockbuster film DABANGG), and Sajid Nadiadwala’s KICK. Looks like after upping its last year’s music acquisition to 85 per cent of music market share, the sky is the beginning for this Music Company. “Bodyguard” was dedicated to you. Now what’s with “Dabangg 2”? The shooting for “D-2” will begin in 2012. I am not sure what sequence I will get, but yes I have a role in that. Arbaaz bhai told me that he has something for me. It’s the biggest honour and I think no one has done so much. What was I? Practically his bodyguard, but the respect he gave to me, it’s out of the world. It means will you be a prominent face in movies as well? No no. I am not a movie material. I am doing because bhai has said. Otherwise I am not an actor. I am happy guarding him and would like to continue it as well. Though Shera addresses Salman Khan as ‘Maalik’, but their equation is completely in contrast with what others perceive.